Product #16235 | SKU PWR-BB-DP7-AB-KIT | 0.0 (no ratings yet) Thanks for your rating! This Kit includes the DP7-Pro Battery Adapter Plate and an Anton Bauer Gold mount plate. This 3-stud battery bracket allows you to use Gold Mount batteries (such as Anton Bauer) to power your DP7-PRO. 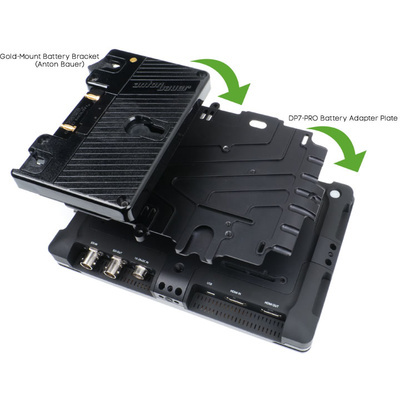 This Kit also inlcudes the DP7-Pro Battery adapter plate. Supplying power through a connection located on the back of the monitor. The QRC-DIGITAL is similar to the QR-GOLD, but is approximately 3/4" smaller (4.7" x 3.0" x 0.5" thick), making it ideal for use with these monitors. This plate comes equipped with a d-tap output so you can power an additional accessory with your battery.